An apprenticeship was an extended period of training in a craft or trade, given to a boy by an established master in the trade. Originally, boys had to be aged from 10 to 18 years old, to begin an apprenticeship, although the Parish Apprentices Act of 1698 reduced the allowable age of entry to seven. The apprenticeship normally lasted until the apprentice was 21. The operation of an apprenticeship was the subject of a legal agreement — an indenture — and usually involved the paying of a fee — the premium — to the master who would also provide the apprentice with board and lodging for the period of the apprenticeship. Most apprentices were "trade" apprentices, sponsored by their parents, and who would hope eventually to set up in trade themselves, perhaps as "journeymen" or day labourers. However, the apprenticeship system could also be used by parishes to take poor children from the workhouse and unburden the rate-payers from supporting them, both in the short and long-term. Under the Settlement Act of 1662, an apprentice took settlement from his place of apprenticeship. It was therefore attractive for a parish to place an apprentice in a different parish which would then have responsibility should he later become a charge on the poor rate. Pauper apprentices did not usually learn highly skilled trades; instead, the boys would be taught "husbandry" and the girls "midwifery" and were effectively labourers and household servants. Some parishes prevailed upon their own rate-payers in turn to take a pauper child for at least a year, or else face a £10 penalty. Sometimes, children were assigned by a lottery. Such impositions were often extremely unpopular, with many householders preferring to pay the fine rather having to take in a child. Where a child was reluctantly received, the result might be it being overworked and poorly treated. A more common procedure was to offer a premium of up to £10 to anyone willing to take a pauper child in for a set period, typically seven years, and train it in a trade. This was the route famously described by Charles Dickens in Oliver Twist when Oliver was offered, together with the sum of five pounds as a "porochial 'prentis". The contract was conditional, as Dickens explained, "'upon liking' — a phrase which means, in the case of a parish apprentice, that if the master find, upon a short trial, that he can get enough work out of a boy without putting too much food into him, he shall have him for a term of years, to do what he likes with." The premiums offered with the children proved an irresistible temptation to needy persons to apply for an apprentice at the Hundred house, whether they wanted the services of the apprentice or not, or whether they could instruct him in any useful calling or not. Their sole object often was to secure the premium. Ten pounds or twenty pounds were wanted to pay a pressing demand. To avoid a warrant of distress for rent due, or for a bill for their stock in trade, some of these petty tradesmen eagerly sought the premium, and thus removed the imminent danger which threatened them. the future care of the apprentice, though a burden which they had often but slender means to encounter, had not such terrors as the present peril. the class of persons to whom the children were apprenticed were generally petty tradesmen of a low caste, who were usually unscrupulous in the neglect of their duties to the children. A parish apprentice is regarded as a defenceless child deserted by its natural protectors, and whose legal guardian, the parish, is only anxious to remove the burthen of its maintenance at the least possible cost, and with the least possible trouble. After a certain interval had been allowed to elapse, means were often taken to disgust the child with his occupation, and to render his situation so irksome as to make him abscond. It will appear from the evidence which I have collected, that many children have thus been driven to ruin. In 1842, a Royal Commission on Children's Employment in Mines and Manufactories reported that workhouse boys in South Staffordshire, some as young as eight, were being sent on "apprenticeships" of up to twelve years working in coal mines. In fact, the boys were usually employed as "hurriers" — conveying corves (large baskets) of coal from the coal face to the bottom of the pit-shaft from where it was raised to the surface. SOUTH STAFFORDSHIRE.— In this district the Sub-Commissioner states that the number of Children and Young Persons working in the mines as apprentices is exceedingly numerous; that these apprentices are paupers or orphans, and are wholly in the power of the butties; that such is the demand for this class of children by the butties that there are scarcely any boys in the Union Workhouses of Walsall, Wolverhampton, Dudley, and Stourbridge; that these boys are sent on trial to the butties between the ages of eight and nine, and at nine are bound as apprentices for twelve years, that is, to the age of twenty-one tears complete; that, notwithstanding this long apprenticeship, there is nothing whatever in the coal- mines to learn beyond a little dexterity, readily acquired by short practice and that even in	mines of Cornwall, where much skill and judgment is required, there are no apprentices, while in the coal mines of South Staffordshire the orphan whom necessity has driven into a workhouse is made to labour in the mines until the age of twenty-one, solely for the benefit of another. As a result, unions in the coal-mining areas of South Staffordshire and the West Riding of Yorkshire were asked to provide detailed information on the children who had been apprenticed in the mining industry in recent years. The return from the Dewsbury Union is shown below. Five-year-old Thomas Townend was a matter of some embarrassment for the Dewsbury Guardians as he was far too young to be bound as an apprentice. The Guardians claimed that when he had been received from a township workhouse his age had been ascertained by informal enquiry and recorded as seven years. Once the error has been discovered, he had immediately been sent back from the mine. However, Children's Employment Commission was told that the boy had only been returned to the workhouse after his grandfather and friends had threatened to report the matter to the Poor Law Commissioners. In their return, the Burton-upon-Trent Guardians were at pains to point out the care they employed when placing children for apprenticeship: premiums in money were not allowed and the boys were instead provided with two full suits of clothes; any master applying for a boy was required to produce a certificate of character from the minister and officers of the parish in which he resides; a trial period of at least six weeks was required, at the end of which the boy was brought before the magistrates and strictly questioned as to his food, lodging, moral and religious instruction, and especially whether he had any objection to the apprenticeship being formalised. Child dragging coal in a Halifax mine, 1842. Children being winched up a mine-shaft, 1842. Patience Kershaw says: I wear a belt and chain at the workings to get the corves [large baskets] out. The getters are naked, except their caps; they pull off all their clothes. I see them at work when I go up. They sometimes beat me, if I am not quick enough, with their hands; they strike me upon my back. The boys take liberties with me sometimes; they pull me about. I am the only girl in the pit. There are 20 boys and 15 men. All the men are naked. I would rather work in the mill than in the coal-pit. Esther Craven says:- I have cried many a time afore now for coming into pit but I have got used to it, a think nought abou being brayed by the getters a bit. Mary Barrett says:- I de not like working in pit, bit I am obliged to get a living. I work without stockings or shoes, or trousers; I wear nothing. but my shift. Ruth Barrett, her sister, says: I come down into pit in linings of old trousers, which I take off. I wear an old waistcoat and shift. I do not like working in pit; I would not do it if I could help it. Critics of the use of apprenticeship, such as Kay-Shuttleworth, proposed that pauper children should be instead provided with "industrial training" within the poor law system, ideally in separate children's industrial schools, each serving a number of unions. Kay was particularly influenced by Mr Aubin's privately run school at Norwood which accommodated more than a thousand residential pupils largely taken from Metropolitan poor-law unions. The work of the Central Society for Education and its 1838 publication Industrial Schools for the Peasantry also stimulated interest in this approach. Although only a small number of unions initially set up such establishments, there was a gradual decline in the use of apprenticeship for pauper children. It did not disappear entirely, however — between 1834 and 1863, the Norwich Incorporation apprenticed 130 boys into twenty trades, although eighty per cent of them went into shoe-making. The Poor Law (Apprentices) Act of 1851 improved the lot of workhouse apprentices, making their mistreatment an offence, and requiring them to receive reqular visits from their union's relieving officer. 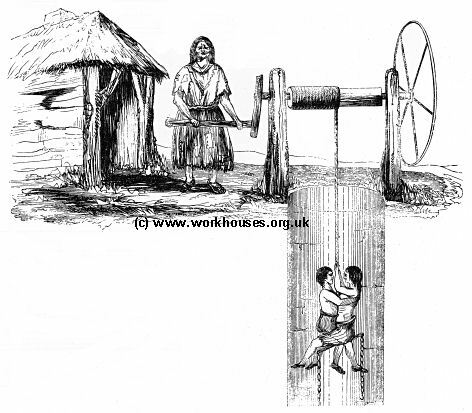 From the 1840s onwards, an increasing number of unions began to provide some kind industrial training within their workhouses, although the resources required to do this made its quality somewhat variable — for girls, it usually included domestic training to fit them for service; for boys in rural areas, training was largely in agricultural work. Some unions were more enthusiastic — Guiltcross in Norfolk even went as far as establishing a workhouse farm for the purpose. The children's cottage homes sites set up from the 1880s onwards also often included industrial training facilities.